With 15 years of design experience in San Diego, I’ve seen some changes now that our economy is rebounding. Naturally, homeowners are much more cautious about spending their hard earned money. Creating a landscape design to be phased is the key. The desire for outdoor living has become even more alluring. The noticeable changes are that now, clients are willing to wait; thus the need for a comprehensive Master Plan. Phasing the construction makes perfect sense. Add the new infrastructure, i.e. a gas line for a future fire pit (phase 3). Even installing the conduit, but install the lighting fixtures later (Phase 4). Add the footing and post anchors for a new pergola and complete it later (Phase 2) as cash flow allows. Besides a colorful umbrella isn’t always such a bad option for a fraction of the cost. The new economic landscape is all about time and planning. Budget is always a consideration when either building a new or a major remodel. 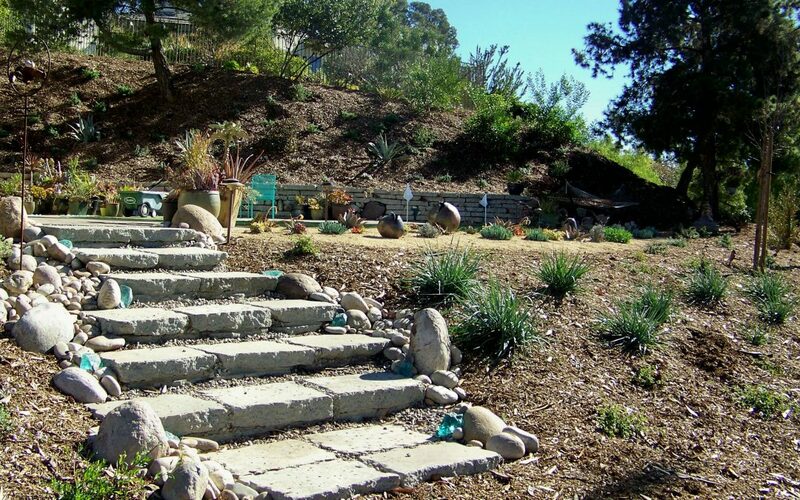 All too often, individuals haven’t considered the cost of landscape features. And at times they have to sacrifice many of their goals as they have little money to work with. On the plus side, re-purposing elements and recycling are more common once again. I’m a huge advocate of saving any established plants or mature trees and incorporating these elements into the design. After all, it takes many years for a tree to grow. Some shrubs with corrective pruning practices may look entirely new over time. Even salvaging existing elements can be an element of a phased landscape plan. Using broken concrete to fashion retaining walls, old brick, or on site cobble or rock, excavated soil for berms, etc. are all examples of recent trends. Gone are the days of tearing up the driveway due to a few cracks. Staining or overlays are realistic cost alternatives. Of course, using smaller plants may offset some of the costs. There are always options to any landscape design to fit your budget. And finally, the thought of sustainability…if you put water on it, make sure it gives you something back. The backyard raised bed vegetable garden, citrus and fruit mini- orchards are so common place in this era. The farm to table concept of dining is so very popular in our local eateries, why not at home? We all had to learn some important life lessons while money was so tight recently, and we’ve adapted. We learned we can have it all, as long as we follow a plan and plan to implement our outdoor spaces over time. Not everyone has to have the built- in outdoor kitchen, some people are content with their gas grills on wheels, their portable fire pits and pre-manufactured fountains. Most of these hardscape elements can be phased in the landscape construction. If only there was a way to have that proverbial Cake, and eat it too(never going to happen)…..so go harvest something from your backyard instead….so much healthier than cake anyway. To learn more about a landscape plan that includes several phases contact Letz Design to get the basics.